First of all, sorry for my english, it’s not my first language and my grammar is not perfect. Back to workbench. Friend of mine was changing his stairs, knowing I want to learn woodworking, he gave me his old beech stairs (with half-floor). All steps and half-floor were 45mm thick, without thinking much, I’ve decided to make a workbench since I didn’t have any good and flat surface to work on. Whole project took me about a year, 3-4 months of actual work (I only have few hours after my day job to make myself useful in my house and if time will let me, do some woodworking after that). Most of the joints are far from perfect, because like I said, it was my first real woodworking project. Dovetails in this bench were actually my first dovetails! So I’m really proud how they turned out. Sides of the top are meranti, just for visual effect, rest is beech. Because vises are really expensive I found used front vise (Lion, made in India) and restored it, and I had to improvise with tail vise, so I bought used trapezoidal screw, few bearings , and I made a tail vise of my own. Nothing special, a screw set in two bearings.. Handwheel on it was made by cutting a circle with my coping saw and refining it with sand paper using hand drill as a “lathe”. Whole bench is about 90cm high, 75cm deep and 175cm long. 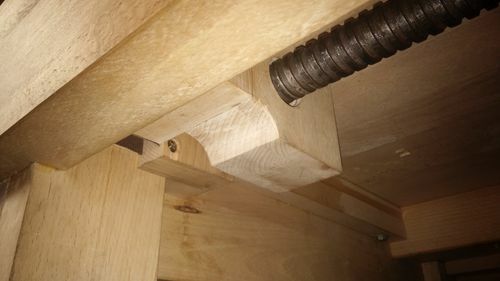 The drawer takes about 20cm out of the bench depth and it’s deep and wide enough to fully “hide” #4 1/2, #5 1/2 or #6+ plane laid on its side if I will ever need more flat working space. Thats a great bench and a clear description. I was wondering about the tail vise. 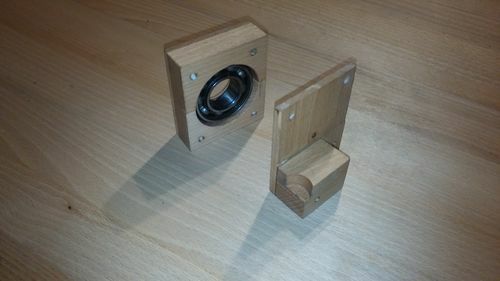 Here are some under the hood pictures of the tail vise. Screw came with matching nut. 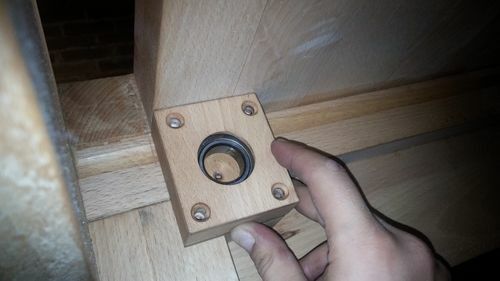 I’ve reshaped round nut to normal nut shape (6 walls) and chiseled matching hole into the moving block, glued everything up, then I made a box holding bearing supporting bavk of the screw. Moving block helped me to mount everything on same level, front and back. I like this very much. Sometimes you just have to run with what you’ve got. -- My mom says I'm handsome. Beautiful work on the bench. Looks pretty stout and heavy. Nice work on the vises too. Looks like it will serve you well for many years.